Homework becomes a power struggle as soon as you try to force your child to do his work and he pushes back. Many parents are trapped in this battle nightly: they’re pulling one way while their child is pulling the other, and in the meantime, no work is getting done at all. If you threaten your child with punishments or use power to get him to comply, he will simply become more aggressive and more defensive as he digs in his heels—and resists even more. Often, when kids start resisting, parents try to use power to get them to do their homework, but for many kids, that will only make matters worse. In fact, you may find that if you threaten your child with punishments or use power to get him to comply, he will simply become more aggressive and more defensive as he digs in his heels—and resists even more. In the first part of this series, I talked about how you can establish the right environment and mindset in your home around schoolwork. Today, I’d like to tell you about techniques you can use in the moment with your child. If you’re trapped in a power struggle with your child over homework, I’d like to tell you that you may be able to end it sooner if you follow some practical ideas. For a lot of kids, sending them to their rooms to do their homework is a mistake. Many children need your presence while they work. We call that technique “proximity”. Some kids simply need to do their homework at the kitchen table. Your supervision and presence actually will keep them from being distracted. Some kids have a hard time sitting down and starting assignments. 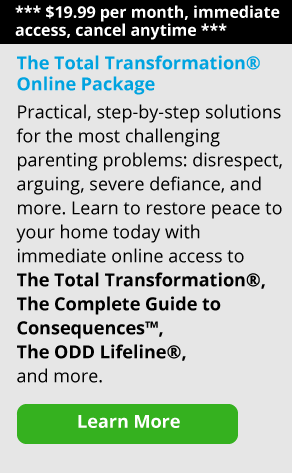 There’s a concept I explain in The Total Transformation Program called “Hurdle Help.” If you have a child who has a hard time getting started, part of Hurdle Help is that parents spend the first five minutes with them. So you get the book started, maybe help them work on the first math problem and make sure they understand the assignment. For many kids who are slow starters, Hurdle Help is very effective. This doesn’t mean you are doing their homework for them—this is simply extra help over the first hurdle that will get them going. Another way to get your child to do homework is to make a game out of it. Challenge them by saying, “Let’s see how long it takes you to get your homework done tonight. And for every minute that you get it done earlier than X, you get to stay up an extra minute.” (Or you might say, “You get to be on the computer an extra minute” or “You get to play video games an extra minute.”) Then you get your child to try to beat his score from last night. Now, eventually you’re going to reach a plateau, and that’s fine—let’s say it’s one hour. When that occurs, you say “every time you match one hour, you get extra minutes.” So your child is competing with himself and you’re making a kind of game out of it with a reward.If there’s a big project they have to do for school and you know it’s not going to take them the normal amount of time, you have to estimate how much time it’s going to take together. Then your child has to work within that time frame. So if your child has a science project, you have to help her manage and structure her time. For instance, if her project is due in 30 days, ask her, “How much time are you going to spend on it a night starting now?” She might say, “15 minutes a night,” and you hold her to that, and keep up with the progress reports the teacher is sending home. A word about homework on weekends: the way that I structure the weekend is that Sunday night is a school night, not Friday. So if your child has homework for the weekend—and as long as he’s done all his work for the past week—he gets Friday and Saturday night off. Sunday night is a school night, but Friday and Saturday night should be free as long as the work is done. If there’s a project or something big to do over the weekend, then you work out with your child on how to set it up. He may have to put some time in on Saturday or Sunday during the day. But other than that, your child should have the weekends off too, just like adults do.Again, if your child has an incomplete assignment from the week that the teacher sent home, he needs to do it. Then, as soon as he’s done, his weekend starts. No consequences, no punishments, just “Get your work done.” If he doesn’t or he refuses, then you can say, “Okay, no electronics for this weekend, then,” as well as being grounded. Kids are involved in a lot of after school activities these days, and I understand that. Personally, my priority has always been “Homework comes first.” In my opinion, if the homework isn’t done on Monday, then your child shouldn’t go to football on Tuesday. It’s fine if he misses a practice or two. You can say, “Here’s the deal: we’re not going to football today. You need to get your work done first.” If your child says, “Well, if I miss a practice I’m going to get thrown off the team,” You can say, “Well then make sure your work is done, because I’m not going to take you to a practice if you’re not doing your schoolwork. That’s all there is to it.” I personally don’t put football, soccer or any other extracurricular activities above homework and home responsibilities. I don’t believe parents should be going from soccer to karate to basketball with their kids while homework and school responsibilities are being neglected. 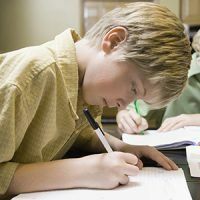 If you have a child whom you feel is really struggling and frustrated with schoolwork, realize that it might not be because they’re bored or don’t want to do the work; it could be a sign to have them checked for a learning disability. You should be talking to their teacher about their level of distractibility and their level of output in the classroom. If your child has a learning disability, they should get an Individualized Educational Plan, or IEP, that you set up with the school. And remember, try to see your child’s teachers as your allies in raising him. They are not the enemy. In my experience, most teachers are dedicated and caring, but I realize that this isn’t always the case. So as hard as it can be at times to bridge the communication gap, you have to find a way to work with teachers for your child’s sake. All the advice I’m giving here is easier said than done, and I understand that. But ideally, we’re trying to raise our kids to be responsible and accountable for their schoolwork, and we’re trying to avoid fighting with them over it every night. When I had parents in my office, I would take these concepts and show them how they could make it work for their families in their own homes. The families I worked with were able to turn “homework hell” around successfully time and time again.